Hier nun die nächste CD & DVD Neuveröffentlichung: Michel Montecrossa präsentiert ‘New President’, sein Message-Song und Musikvideo für Barack Obama. 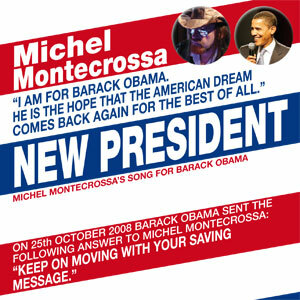 ‘New President’ released by Mira Sound Germany, as single Audio-CD & DVD presents Michel Montecrossa’s great message song for Barack Obama. New President, new Power, new Action, new Intentions and I hope for sure: new also the direction. New President in our country, new President in another country, new President in any country, new President – who is that? One President there is almost no-one knows. Looking after all the things human and more. New President wherever you are, new President, whoever you are: take the lead, show the way of the One I mentioned. Don’t be another fool believing himself to be someone without really knowing the One: Don’t be such a fool. Don’t be another president but be the true President telling Truth, bringing Peace, working for World-Union on this Earth. 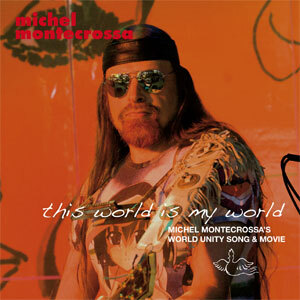 Mira Sound hat nun Michel Montecrossa‘s Weltvereinigungs-Song und Musikvideo ‘This World Is My World’ als Single CD & DVD veröffentlicht. ‘This World Is My World’ released by Mira Sound Germany, as single Audio-CD & DVD presents Michel Montecrossa’s great WORLD UNITY song and movie. This World is my World, this World is your World, she is the symbol and the Real of all our souls can ever dream. This World is my World, this World is your World, we are the guardians and the helpers for her way into the Morn. This World is my World, this World is your World, honor her and always know: we are here for her highest Dawn. Hier ein thematischer Songtext von Michel Montecrossa’s ‘Peace & Climate Change Concert Tour’ – das Lied ‘Sweet Earth’. I’m living on a globe somewhere in the space-time-whole. ‘Sweet Earth – Save The Climate Of Our Earth #1’ released by Mira Sound Germany on two Audio-CDs presents 29 stunning and outspoken free-mind songs on the pressing questions of climate change by 21st century’s great topic songwriter Michel Montecrossa. The 29 songs include the title song ‘Sweet Earth’, the incredible ‘Great Planet Song’, the deeply touching ‘What A Time’, the straightforward ‘I Want To Live’, the tender ‘Natural Queen’ and ‘Of Love I Sing’ as well as the german rocker ‘Gift (Poison)’, the profound ‘The Place Of The Free’, the powerful ‘Weatherman’ and the great anthem ‘This World Is My World’. 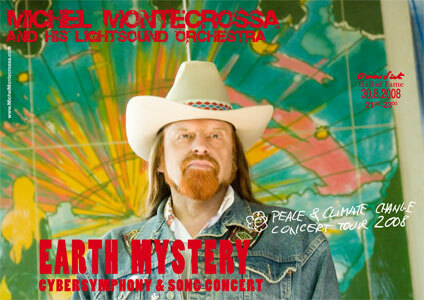 Disc Two of the ‘Sweet Earth’ production features the complete live recording of Michel Montecrossa’s legendary concluding concert at the Spirit of Woodstock Festival 2006 in Mirapuri, Italy. Together with his band Michel Montecrossa performs from his treasure of music outstanding song gems like ‘Pace e Amore (Love Is The Answer)’, ‘From Michel In Mirapuri’, ‘Fire On The Water’ and ‘Bird Of Peace’ ringing with his message of hope and awareness. Rekordergebnis: Michel Montecrossa jetzt mit 419 Neuinterpretationen von Bob Dylan Songs!!! Diese 419 Lieder setzen sich zusammen aus den veröffentlichten Bob Dylan Songs, einer ganzen Reihe von unveröffentlichten Titeln, Stücke anderer Interpreten, die von Bob Dylan gesungen wurden und Bob Dylan Texten, zu denen Michel Montecrossa die Musik geschrieben hat. Alle Infos und CDs der Serie ‘Michel Montecrossa sings Bob Dylan’ natürlich auf der Homepage dieser Serie Michel Montecrossa sings Bob Dylan und die CDs kann man im Mirapuri Shop www.Mirapuri-Shop.com oder als Download bei Apples iTunes Music Store www.Michel-iTunes.com und anderen Online Musik Services kaufen. Michel Montecrossa by now has recorded 419 Bob Dylan cover songs which are all available on Audio-CD and DVD from www.Mirapuri-Shop.com as well as from Apple’s iTunes music-store (www.Michel-iTunes.com) and other online services. The recordings include covers of all officially released orignal songs by Bob Dylan and many rare and unreleased songs, traditionals and songs of other artists which Bob Dylan sings at his concerts as well as lyrics by Bob Dylan with the music of Michel Montecrossa. ‘Eye of Odin’ Wikinger-Konzertvideo ist online!!! Hier ist es!! Das Free-Style Olympia Musikvideo ‘Believe in your dream’ von Themen-Songwriter Michel Montecrossa!!! Yeah folks!! 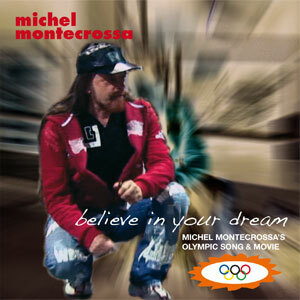 Here it is – the free-style Olympic music video ‘Believe in your dream‘ by topical songwriter Michel Montecrossa!! ‘Believe In Your Dream’ released by Mira Sound Germany, as single Audio-CD & DVD presents Michel Montecrossa’s great OLYMPIC song and movie. Am 30.08.2008 werden Michel Montecrossa und sein Lightsound Orchestra in der Omnidiet Hall of Fame ein Open-Air Cybersymphony and Song Concert mit dem Titel ‘Earth Mystery’ geben. “The earth mystery is revealed in every blooming rose and in our feeling of how lovely and fair she is. The earth mystery is revealed in every moment of soul meeting nature and of nature touching soul. 10 thrilling high-energy-Cyberrock-Spirit-of-Woodstock-Festival-2008-days with Michel Montecrossa, Mirakali and Diana Antara shone like diamonds and when you will see and hear them on CD and DVD (yeahhhh!!) you will surely know where to go next summer to see it LIVE!!!!!!!!!!!! And the next fantastic Open- Air music-event already approaching fast – I want to announce here the ‘Earth Mystery’ Cybersymphony and Song Concert by Michel Montecrossa and his Lightsound Orchestra that will be staged on 30.08.2008 at the Omnidiet Hall of Fame.